On the road again… to Indiana, this time! We’re heading out again, this time to LaPorte, Indiana to my Grandma Vivian’s house. My parents are driving down from Wisconsin, and Anna and Hal are also flying in from Seattle. It’s going to be a houseful, and we’re going to love it! We’re getting pretty good at getting packed/unpacked. I’ve just finished all the laundry from our last trip, and the couch is covered with the warm clothes to go back in the suitcase. We’re leaving around 6pm, and if all goes well, we should pull into LaPorte around 6am. Brian’s a trooper to drive us through the night! I’m loading the iPod with new music (well, at least music we haven’t listened to for a while from our dusty CD collection!). The kids should go to sleep by 9 at the latest, and I’ll read Brian some from our current book, A Year of Living Biblically. Which, by the way, is fantastic, funny and thoughtful, and a terriffic glimpse into the Book of all books. It’s written by an agnostic Jew, who decides he wants to know what it would be like to really live everything the Bible says, literally. I thought it would be irreverent at first, but it’s not in the least bit. He’s humble and honest, and seriously seriously funny. We’re excited to be seeing my family! I’ll check in while we’re gone. Happy Thanksgiving, y’all! Well, actually, it wasn’t the weekend. We left home on Thursday at 6pm, had a smooth 5-hour trip, concluding with the bright Christmas lights of Sevierville, Pigeon Forge and Gatlinburg, arriving at 12:30am local time. 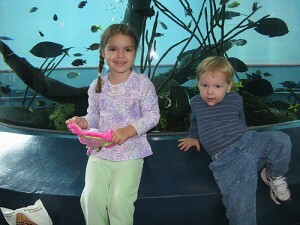 The kids and I visited Ripley’s Aquarium on Friday morning. We had a great time, of course. This was one of the first times it was really an interactive experience for both of them. Analise was full of questions, and Josiah was really appreciating things, too. We got a big long nap in our spacious, quiet apartment, right next to Brian’s conference hotel. He had worked nearly all night to finish his presentation, and he spent all day over at the various sessions. We woke up just in time for him to come home and take us down the street to dinner at Bubba Gump’s Shrimp Factory. We made the cold walk back up the hill, and caught a trolley to ride around town and see the beautiful Christmas lights. Poor Brian crashed early for the night, and amazingly, the kids slept long and hard for us. Brian had planned to get up this morning and ride up to the mountain pass, as he’s done the past few years, and he was really looking forward to it. But he slept too late, it was very-VERY cold for riding (in the low teens! ), and after we drove up, we found the road was salt and snow covered, so he wouldn’t have made it far anyway. So we enjoyed a relaxing morning getting packed up, grabbing breakfast, and driving up into the mountains. 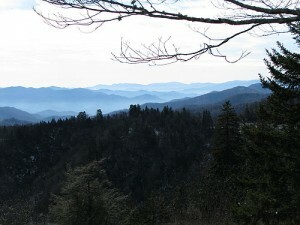 We played in the snow at a couple different stops, and drove the long way home through the Great Smoky Mountain National Park. This was a fun trip. 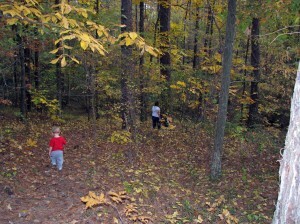 I have probably said this before, but my kids are getting to fun ages so that we can really enjoy traveling. Yes, the hours in the car can be really long, but we laugh, sing, play and find lots of fun things to see and do. I’m already looking forward to next year! Enjoy the pictures! 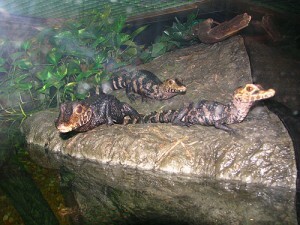 Our camera has an aquarium setting for low-light/no flash, so some of the photos got very grainy. Click on each to see the larger version, then you can click the “back” button to come back to this post and look at the others. 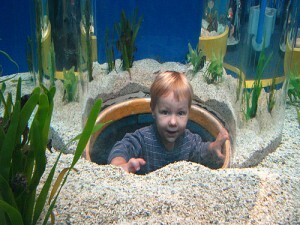 Analise in the walk-through aquarium tunnel. 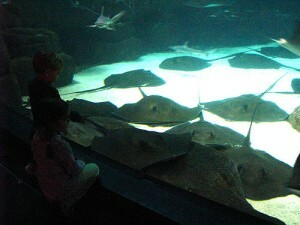 All the sting rays were piled up, like it was naptime. There must have been 40 of them laying on the bottom! Very cool. 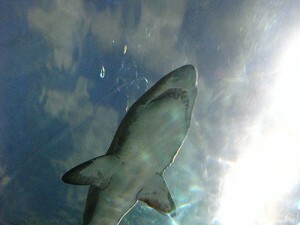 A shark swimming over us in the walk-through tank. 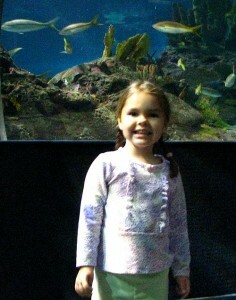 My cuties at the Ripley’s aquarium. 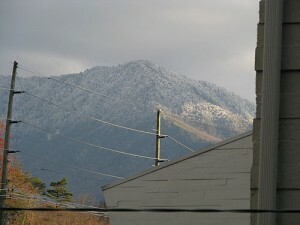 The beautiful frosty mountains above Gatlinburg. Christmas is coming! 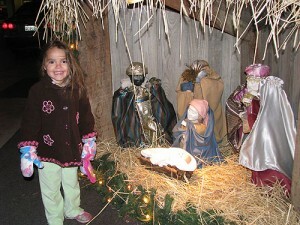 No Christmas decoration makes Analise happier than a nativity! 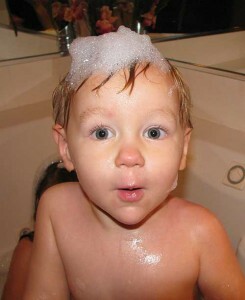 Enjoying a bubble bath in the jacuzzi. I think J got the brunt of the bubbles. 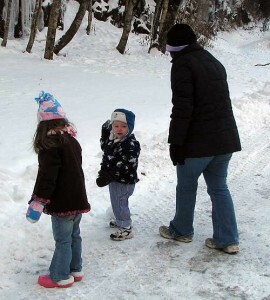 Josiah was our little snowball-thrower. No one was safe from him! 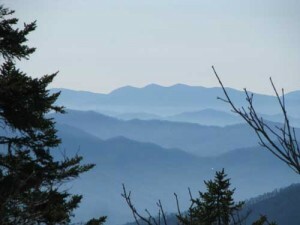 The beautiful Smokey Mountains from the high point overlook. 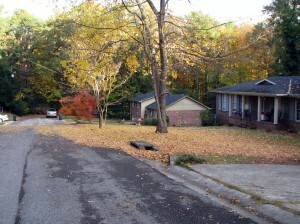 It’s finally turned cold here in Birmingham. 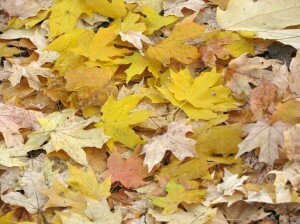 The leaves have been gloriously beautiful the past couple weeks, and it’s so nice to finally know that fall has arrived. 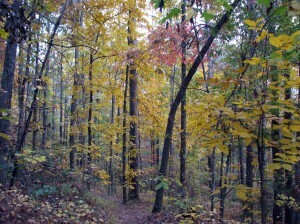 This is the 3rd year in a row we’ve made this trip to Gatlinburg, and it’s a nice fall getaway for us as a family. Here’s a glimpse from 2 years ago with a little 4-month old Josiah and a super cute 2-year old Analise. 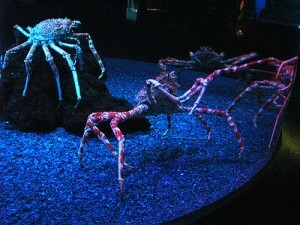 I didn’t post any pictures from last year, but Brian’s parents went with us, and we enjoyed the Ripley’s Aquarium. Like last year, we’re staying in a nice little apartment/townhouse next to the conference hotel, but his parents aren’t going. We’ll enjoy our little place, go swimming, walk around town, see the Christmas lights, and drive up into the Smoky Mountains a little bit. 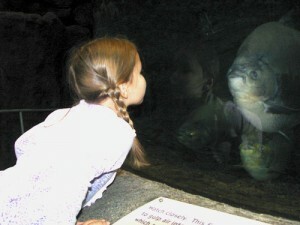 The kids and I will do the aquarium, I think, while Brian’s at his conference tomorrow. Should be fun! VERY VERY cold (for us Southerners!) but fun! The high on Friday is forecast to be 36 with a low of 18! That is about as cold as it gets in the south! Hopefully, we’ll check in tomorrow or Saturday with some pictures. Happy weekend! As a mom, you’re always needed. From the moment the little one is born, they need you for everything. It’s endearing at first, but then it’s exhausting. I’ve been very needed for over 4 years. Breastfeeding was a wonderful experience, but talk about being needed! I’m needed to pour juice, button buttons, reach things on the top of the dresser. I’m needed when I’m in bed, when I’m washing dishes or cutting meat, when I’m in the shower. I’m feeling awfully tired of being needed. But just today, I remembered that I’m not always going to be needed like this. 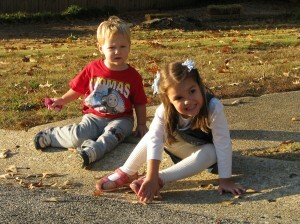 Each day, Analise and Josiah are more independent. More FIERCELY independent, I should say 🙂 Analise wants to make her own chocolate milk, pick her own clothes, do the craft project HERSELF. Josiah has to walk down the stairs and climb in the car and into his carseat on his own. And each day they are closer to being on their own, taking care of themselves. 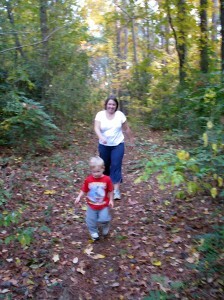 I’ll always be mom, and they’ll always need me to be there for them, but they won’t really need me for much longer. So I’m going to try to remember that and appreciate all the little itty bitty things they need me to do each day, over and over again. Snuggle my little boy close when I’m putting his shoes, on, sneak a hug as a thank you when I’m done making Analise’s lunch. And most importantly, I’ll try to remember that even “the Son of God did not come to be served, but to serve” (Mark 10:45). 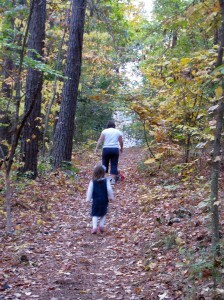 We just got back from a walk around our neighborhood and through the woods. 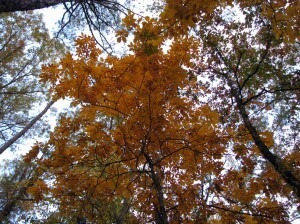 The fall colors exploded today. 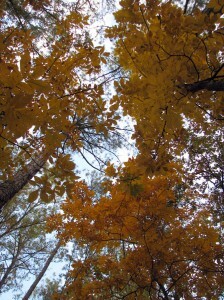 I took some pictures of the beautiful trees on my commute home from work today. 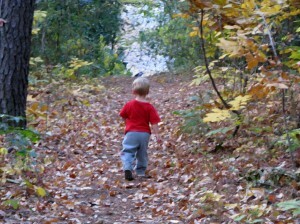 Then we went for a walk and got some more pictures. 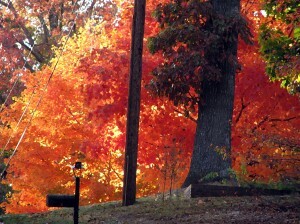 Fall is so beautiful in Birmingham! 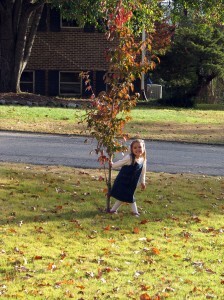 Analise smiles for a picture as she dances around “her tree” — the tree we planted for her when she was just 6 months old. Josiah fell down right as I took this picture. I’m surprised I didn’t catch him in mid-air because the timing was just that close. I dry-brushed this image but left the colors alone – it was incredible with the sunlight making the leaves look like they were on fire! 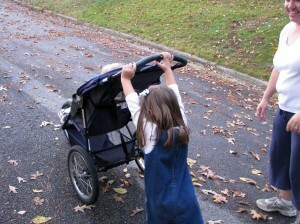 Analise was able to push Josiah up this steepest hill in our neighborhood, but only for about a foot or two before it started to roll back on top of her when she decided she was tired. I was all stocked with 4 kinds of snacks, books, MagnaDoodle for scribbling, and even my iPod with a new Little Einsteins video on it in case I’d have to wait a while. But the hardest part for us was navigating the busy parking lot to get in and out! It only took us 10 minutes to get checked in, fill out our ballot and have it scanned. He’d hardly even gotten through his first snack. Then we proudly wore our “I voted” stickers back to the car. When I told Josiah we were going to vote this morning, and he thought we were going to a BOAT. So it was a little bit of a disappointing experience for him. Thankfully, Krispy Kreme redeemed the experience with the free star spangled chocolate donut that we picked up on the way to Grandma’s. We’ve never been one for naming the pacifier. It’s always been a pacifier around our house, except that Analise used to call it his “fire” back when Josiah was littler. Since he’s learned to talk, that’s been what Josiah calls it, too. “Where’s my ‘fier?” he’ll call at bedtime. We try to put the ‘fier back into his crib when we get him out of bed so it’s easy to find at naptime and bedtime. Well, actually both ‘fiers, since he likes to keep 2 with him at nighttime. If he ever gets 3 at bedtime, he’s purely giddy with excitement. He’s done pretty well to not use his pacifier except when he sleeps, but sometimes he’ll go find it when he’s tired. He has learned lately to reach through the crib slats and even move the bed away from the wall to get to it on the floor. “Josiah, you don’t need it now. It’s not naptime anymore.” His response about melted me. “I just wanna snuggle wif you on da couch, Mama. I need my ‘fier.” Needless to say, I snagged his pacifier for him, and we curled up on the couch with Analise for a cuddly few minutes. I won’t ever pass that opportunity up, pacifier or not.